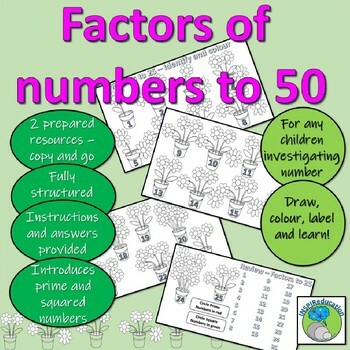 This activity encourages children to learn about factors of numbers from 1 - 50 using two different activities. Provides the children with 25 flower pots. Each flower pot is number from 1 - 25. Within the pot grows a number of flowers - each flower represents a factor. 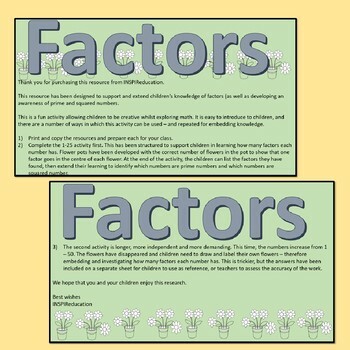 10 = 4 flowers for 4 factors. The children should write the factors of the number on the flower pot in the centre of the flowers, and colour the flowers to make the learning stand out. 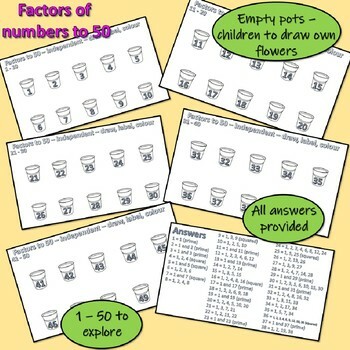 At the end of the activity, there is a review sheet where the children can record the factors of the 25 numbers they have investigates. 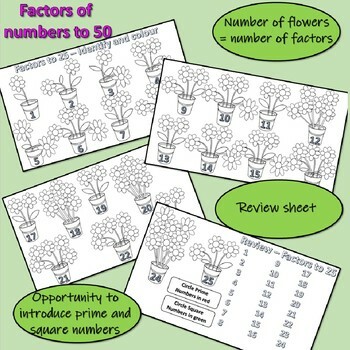 On this page, there is also an opportunity for the children to think about prime numbers (those numbers with only two flowers - or one if it is number 1) and those numbers which are squared numbers (those with an odd number of factors as the same number appears twice). Independent learning - children must apply what they know to complete the first 25 and then extend their learning from pot 26 - 50. Each of these resources can be photocopied for each child and creates a fantastic Math Center, homework activity or early bird activity. Full answers are provided, so children can check their own learning, or make life easier for the class teacher to assess the accuracy of the learning. Full instructions are provided within the download. Thank you for viewing this resource.